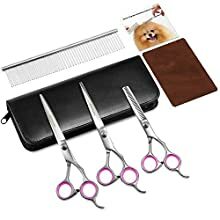 If you are a professional groomer or a dog owner you will require the best professional dog grooming scissors for trimming or giving a full haircut to your dog. By best grooming scissors we mean the ones which are perfect for cutting pets hair. Taking your dog to a grooming salon can be quite expensive so we recommend you to groom them yourself at home. To groom your dog flawlessly you’ll require an ideal pair of scissors beside a dog clipper and a brush, and for that purpose, there are a huge number of dog grooming scissors available on the market. So to make your search easy we have made a list of best professional dog grooming scissors. 3.1 What is the difference between a shear and scissors? 3.2 What does ‘ergonomically designed’ mean? 3.3 Are there any scissors available for left-handed groomers? 3.4 What are the different types of edges for scissors? If you are a first timer then it’s best to go for professional dog grooming scissors with rounded tips. These round tip scissors are much safer and prevent your dog from getting harmed. 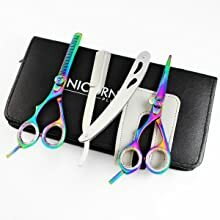 There are a number of scissors with rounded tips, however, there are also plenty of straight scissors which require extra attention especially if you are not a professional. There are various types of blades, but make sure you go for the dog grooming scissors which comes with the premium quality stainless steel blade. If you want your scissors to last longer then buy the stainless steel blades as they are durable, besides that they are exceptionally strong. Furthermore, it has the ability to maintain its sharpness for long-term thus resulting in superb cuts and reduces the danger of dragging your dog’s coat. At present, there might be many different materials for blades available, but it’s best to go for stainless steel blades for great performance. When it comes to your dog’s grooming safety is of the utmost importance. Keep in mind that they can move anytime so you should use safer scissors to prevent your dog from any harm. If you want to experience comfort while holding the dog grooming scissors then it’s better to go for the ones those ergonomically designed. The scissors with a comfortable grip has proven to be easy use for longer periods of time without your hands feeling fatigued. The scissors equipped with rubber or ergonomic grip are the absolute best option. Grooming session can last for a while, that’s why it’s better to choose scissors those are hand-friendly. There are few other features as well that enhance the comfort level such as the finger rest option or a comfortable thumb hole. If you are a professional who uses grooming scissors on daily basis then comfort is a necessity. Another important thing to consider is to make sure that the grooming scissors match the coat of the dog. For example, there are certain dogs with thin hair but more volume so for grooming them it’s better to use thinning scissors. However, for dogs with rough coats, you should use sharper scissors. 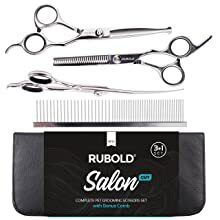 If you want to buy a satisfactory scissors kit without having to spend tons of bucks then you must pick RUBOLD professional dog grooming scissors. Unlike regular scissors, these have razor-sharp blades which are made of high-quality material. The material used to makes its blades are strong and premium quality stainless steel. Most of the times groomers get extremely frustrated when they are unable to tighten the blades, however, this is not the case with this one, it comes with adjustable screws those are exceptionally simple to fine tune. If you want to improve your grooming experience then go for it. Besides that these scissors are very safe and comfortable to use. They rounded end tips ensure safety when you are grooming areas such as eyes, face, paws etc. All the scissors in this kit have an ergonomic design and besides that, the finger holes are cushioned to enhance the comfort level. You can use them both at home and at your professional salon, they will stay just fine and sharp even after being used for many hours. They are ready to use as soon as they are out of the box, they come pre-sharpened and are best for touch-ups, trimming, detailing and a lot more. You can easily remove any tangles with the help of the steel grooming comb that comes with the package. It needs sharpening before each use. These scissors come in a cute zippered case. There are various types of scissors present. The curved one is best for trimming around sensitive areas such as legs, ear or eyes. The chunker shear is great to thin the fur and the straight one is for cutting the long hair. There is also a grooming comb present in the kit that allows you to detangle the hair. In addition to that, it has an ergonomic design which ensures maximum comfort. The finger ring consists of a non-slip plastic that makes sure your fingers can work longer without getting fatigued. Between the finger handles there is a silicone pad that ensures your fingers are protected from any accidental clamping and prevents the scissors from making any noise that might scare your dog away. Adjustment screws need more improvement. These scissors are extremely safe as they come with round tip, atop you can use them to trim your dog’s hair without the fear of hurting him. They are perfect for use around sensitive areas like ears, paws, and eyes. The edges of these scissors are sharp thus giving great detailing, besides that they are highly durable. Because they are made from high-quality heavy-duty stainless steel, they tend to be quite strong and functional. To enhance your comfort with the scissors the manufacturers have designed them ergonomically. It further allows your hands to work without feeling low in energy. The finger handles contain silicon pad that prevents your fingers from clamping hence protecting them from any harm. Apart from this, the pad makes sure your dog doesn’t get terrified as they get frightened from noisy clippers. Three types of scissors are present in the kit straight, curved and thinning scissors. The big straight scissors are used to cut hair on the flat parts, whereas the smaller ones are used to trim the hair around nose, ears, and eyes. The curved scissors are mainly used to trim your dog’s belly, legs, and facial hair. Lastly, the thinning scissor is used to give a natural look by thinning the hair. The Kingstar Titanium Professional Grooming Scissors are one of the best professional dogs grooming scissors available on the market. 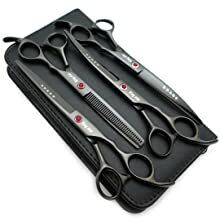 This grooming kit comes with four pieces in one set including two curved scissors, one straight scissors, and one thinning scissors. 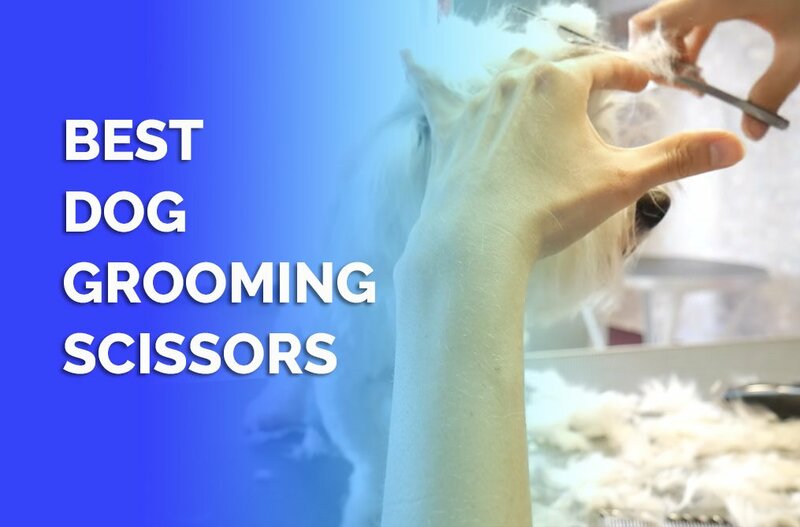 All of these scissors will help you groom your dog beautifully every time. 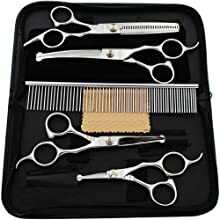 Moreover, these dog grooming scissors are made of premium quality stainless steel, besides that to increase durability and functionality they are further coated with titanium. With these scissors you won’t experience any friction while you are cutting the hair; all of them are durable, sharp and above all extremely smooth. If you are looking for scissors which will fulfill your grooming needs then they are perfect for you. The best thing is that the ergonomic design helps to increase your comfort level while you are using them. The presence of sharp blades eliminates friction. Does not include rounded tips for safer use. These sharp scissors are one of the best professional dogs grooming scissors for left-handed you’ll ever get. They are both reliable and stylish, besides that they are perfect for both professional and personal use. Barber razor is the most important thing when it comes to grooming your dog; Unicorn Plus understands this that’s why they have added a free razor in the kit as a gift. If you are looking for scissors which are capable of giving uniform results then this ought to be your choice. Their thinning shears are just perfect; they give soft feathery look by adding volume. Moreover, the left-handed pet grooming scissors are right for each and every dog. The best part is that they give a 30 days money back guarantee so you can buy with a relaxed mind because if you are not satisfied with the product you can return it and get your money back. What is the difference between a shear and scissors? Scissors and shears were completely different things in the past, but now these two words are almost synonymous. So now you can call your grooming equipment either scissors or shears as both the words represent the same thing. What does ‘ergonomically designed’ mean? The term ergonomic basically means to explain the science of the way the body moves. Ergonomically designed scissors are the ones which support the movement of both your dog and yourself. Moreover, the ergonomic design helps you groom your pet comfortably. Are there any scissors available for left-handed groomers? There are many left-handed scissors available on the market but make sure you are picking up the real ones. You can get to know the difference between right and left-handed scissors by looking at the ring holes. Many people think that it doesn’t matter if they are using the wrong type of scissors but they don’t know that it affects the complete grooming experience. You should look for specialized left-handed scissors if you want to groom the dog perfectly. What are the different types of edges for scissors? The three types of edges we are going to discuss include convex, serrated and beveled edges. The convex edges, also known as modern edges, give great performance and last for a long term. Apart from that, they cut extremely easily and smoothly, and mostly professional groomers can be found using them. You can buy them for home use but you won’t be able to take their full advantage if you haven’t used them before. The serrated edges consist of high-quality stainless steel which makes them quite durable and enhances the quality. The beveled edges are the third type of edges which are the oldest edges and a bit heavier thus require more push. There are several things you should consider while buying the best professional dog grooming scissors. Make sure they fulfill your needs, have rounded tips, and that they have an ergonomic handle as well as a stainless steel blade. Purchasing the right scissors can enhance your grooming experience, we hope this article helps you make a perfect choice.